In a pyrex measuring cup, mix everything together. 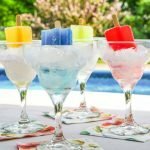 Pour into popsicle mold. Note this only makes 2 pops. If using salt and sugar, mix them together and set aside. Place popsicle in freezer for about 20 minutes. You want them form a frozen layer on the top but still be able to get a popsicle stick in. Take them out of the freezer and add your sticks and then sprinkle salt and sugar mix on bottom if you using. Freeze for 2 hours or until frozen solid. NOTE: Most of the Torani Sugar Free syrups have 0 carbs and 0 calories. However the Pineapple and Red Raspberry both have 1 carb per 2 Tablespoons. So adjust your nutritional information accordingly.